The gamers are floodin’ down to Texas, and hopefully the power lines don’t go down (again). 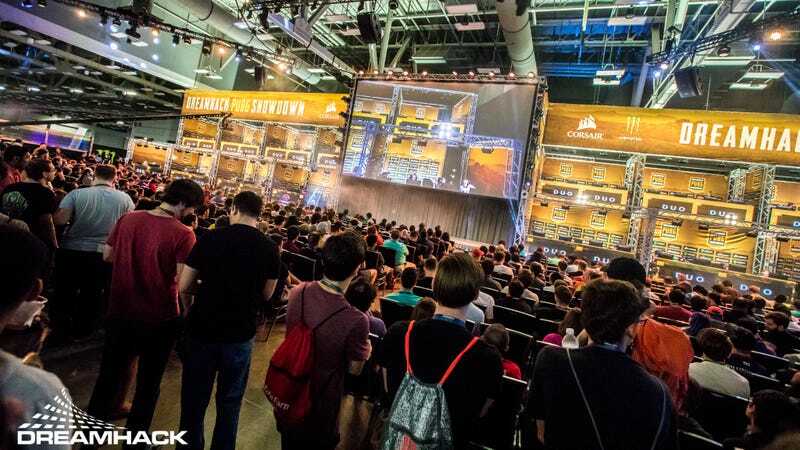 DreamHack Austin is this weekend, where a number of tournaments including Rainbow Six Siege, Counter-Strike, StarCraft II, and several fighting games are taking place. Yours truly is down there just for today, so if you see a haggard old soul hovering around a Soulcalibur II cabinet in the arcade area, come say hey! There are a lot of events going on at DreamHack this weekend, so head on over to the Austin landing page to see what games (including those listed above) are being played. Each page has a schedule and stream links on it, or if you’re a fighting game spectator, head on over to the Smash.gg landing page to see all the brackets and info. We’re in week 3 of the last stage of the Overwatch League, and the playoff picture is coming into focus. Tonight, Dallas tries to upset London and Houston looks for a needed win against Florida to stay in good overall standing. Catch it all on the Overwatch League Twitch channel starting at 4:00 p.m. ET. The waterpark Smash Bros. tournament returns to the Wisconsin Dells this weekend, where up-and-comers will look to make a splash against the game’s best. Dive right in by swimming over to the Smash.gg page for brackets and stream info, and don’t forget to bring a tow—holds finger to earpiece—sorry folks, I’m being told, “no more waterpark jokes.” Just uh, enjoy the good Smash I guess. The final major of the Dota 2 season is underway, and like all good Dota majors, it’s in a timezone that completely ruins my sleep schedule. The Supermajor in Shanghai, China will answer the final burning question of who will make it into The International 2018 with a direct invite, and who will have to duke it out in the qualifiers. OpTic Gaming and VGJ.Storm are both contenders, and in the same group too, so look for those matches to get heated. Follow the matches, live now, over on the PGL Dota stream. The 2018 Eleague Street Fighter V Invitational is underway, but if you’re reading this, it’s too late. Matches were last night, but if you head over to Eleague’s video archives on Twitch, you’ll find them in all their recorded glory. The LCS is still on a well-earned vacation, but the Demacia Cup is there this weekend for those still hungering for Rift wars. Follow the official Chinese stream here, and head over to the League Gamepedia page for a handy-dandy timezone converter for the matches. The FIFA eWorld Cup is looming, and today the PlayStation hopefuls will compete in the global series playoffs to earn their shot at the title. Fun fact: FIFA has my favorite way of solving the console dichotomy by having Xbox and PlayStation players compete in their own brackets, then the champions of each play each other in two matches—one on each console—and the aggregate score determines a victor. Rad! Check out the PlayStation FIFA action on Twitch. Did we miss anything? Got a local you want to shout out? Is Stevie Ray Vaughan truly a musical icon? (The answer is yes.) Let us know in the comments!